This week’s theme includes a wide array of furniture, a few Easter items, toys, tools, clothing and footwear, and items for the kitchen. 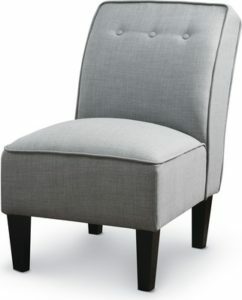 SOHL Furniture Exclusive Collection Tufted Slipper Chair, $69.99. Measures 21.5″ x 31.5″ x 34.4″. You also can purchase a matching SOHL Furniture Exclusive Collection Tufted Round Storage Ottoman for $39.99. In case you’re wondering whether SOHL Furniture seating is comfortable, I recently purchased the SOHL Furniture Mesh Office Chair and haven’t regretted it. SOHL Furniture Exclusive Collection Leaning Bookshelf, $39.99. Each shelf holds up to 20 pounds. Huntington Home 5′ W x 7′ L Printed Reversible Area Rug, $39.99. Comes in assorted varieties. Huntington Home Oversized Plush Throw, $9.99. Measures 60″ W x 70″ L.
Easy Home 5′ Fold and Roll Table, $29.99. Measures 60″ x 28″ x 29″. Mattel Licensed Vehicle Assortment, $2.99. Easter Animal Plush, $2.99. Assorted varieties and sizes. Baby’s First Classic Baby Doll Assortment, $6.99. Measures 11 inches long. Huntington Home Tin Easter Basket, $1.99. Assorted colors and varieties measuring 7″ tall. Huntington Home Easter Egg & Grass Assortment, $1.99. These come in assorted colors. Choose from an 18-count Small or 12-count Large. WORKZONE 18-Piece Screwdriver Set, $9.99. WORKZONE 2.5-Amp Oscillating Multi-tool with 7-Piece Accessories, $24.99. WORKZONE LED Work Light, $12.99. WORKZONE 4-Step Aluminum Ladder, $29.99. Maximum working height of 9 feet. WORKZONE Heavy Duty 5-Tier Shelving, $29.99. Each shelf holds up to 150 lb. Measures 36″ x 18″ 72″. WORKZONE 5-Tier Black Shelving, $39.99. Each shelf holds up to 350 lb. Measures 36″ x 18″ x 72″. Also available: WORKZONE 3-Tier Black Shelving for $14.99, measuring 23″ x 13″ x 30″ and with each shelf holding up to 160 lb. WORKZONE Connectable Moving Dolly, $16.99. Holds up to 330 lb. Measures 23″ x 15″ x 5.3″. WORKZONE 18″ Push Broom, $6.99. Serra Ladies’ Denim Shirt Dress, $12.99. Assorted colors in sizes M-XL. Serra Ladies’ Jeggings, $9.99. Assorted colors in sizes S-XL. Lily & Dan Girls’ Ballet Flats, $6.99. Youth sizes 5/6 through 2/3. Crofton 20-Piece Flatware Set, $14.99. Choose from Square or Round pattern. Includes service for four. Crofton Platter or Bowl Assortment, $6.99. Crofton 4-Piece Glass Bakeware With Green Lids, $9.99. Includes one 3-quart Baking Dish and one 8″ Square Baking Dish with lids. Crofton 30-Piece Assorted Food Storage, $4.99. Crofton 2-Piece Cake Pan or Muffing With Carrier, $6.99. Choose from 9″ W x 13″ L Cake Pan or 12-cup Muffin Pan. Crofton Marble Cutting Board With Slicer or Marble Serving Tray, $9.99. Marble board keeps cheese cool. Cutting Board is 9.45″ x 8.62″ x 0.79″; Serving Tray is 9.06″ D x 4.65″ H.
Crofton Brushed Stainless Steel Hosting Utensil, $3.99. Choose from Scissor Tongs, Turner, Ladle, Spoon or Slotted Spoon. Crofton Melamine Round Platter or 2-Pack Dinner Plates, $3.99. Platter diameter is 14.5″; Dinner Plate diameter is 10.5″. You also can purchase the Crofton 4-Pack Appetizer Plates or Bowls for $3.99. Tyson USDA Choice Beef Pot Roast Kit, $8.99 for 2.75 lbs. Seasoned Chicken Breasts, $3.79. Choose from cilantro lime or southwest. Thick Cut Boneless Pork Chops, $2.99. Crofton, Easy Home, Huntington Home, Lily & Dan, Mattel, Serra, SOHL Furniture, Tyson, WORKZONE. Bookmark.